← Giveaway – Keurig K75 Platinum Brewing Machine & Brew Over Ice K-Cups! Happy Friday! Still summertime and the livin’ is easy…so kick back this weekend with an ice cold beer and this dish for a light lunch or dinner. Combine all ingredients except avocado and stir until combined. Cover and refrigerate for at least 30 minutes, or up to one day. Stir before serving, and top with avocado. 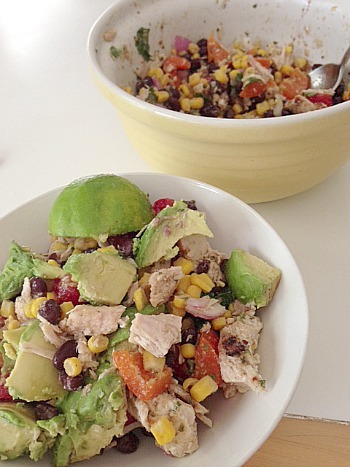 This entry was posted in avocado, beans, chicken, peppers, QuickAndEasy, salad. Bookmark the permalink.